And, Since you’re on a Temple Kick, Why not See a Cathedral? Among the world’s best cities, Singapore is one of the greatest. You want good food? Check. Modern facilities? Check. Safety? Check. A major hub to fly in and out of? Check. People come to Singapore to collect experience stories. A Singapore itinerary of 4 days will give you plenty of time to soak in a ton. So, asking yourself how to best spend 4 days in Singapore is really a question of what your priorities are because you can do so much in this city-state. Having gone twice, we’ve narrowed down our favorite things to do, which, simply put, means eating and looking at incredible sights. 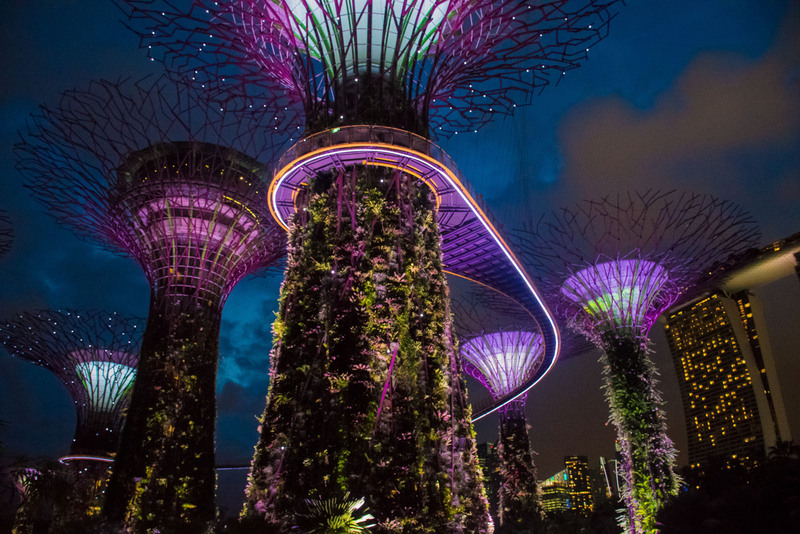 Spending 4 days in Singapore will give you enough time to sample the different neighborhoods, explore different areas, and eat without feeling too rushed. In this itinerary, we’ve intentionally created routes that take you past places you’ve been before. 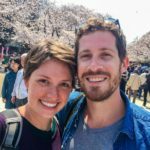 There are lots of opportunity for walking (we love doing this anywhere we go) and the majority of this Singapore Itinerary focuses on the downtown area. We have not suggested Sentosa Island, and have only recommended things we’ve done ourselves. Some days are lighter than others. We know from experience that 4 days in Singapore can feel like a whirlwind, so it’s good to take breaks during the day and literally chill out. Everyone and their grandma will tell you that going to Gardens by the Bay is a good idea. They are not wrong. Here is a sweeping complex of art, nature, and architecture interwoven into a spectacular haven from the muggy streets of Singapore. The lines weren’t too bad when we went, and we got tickets to go see the Cloud Forest and Flower Dome which cost us about $28 SGD ($21 USD) each. I don’t think a Singapore itinerary would be complete without a visit to the the Cloud Forest. 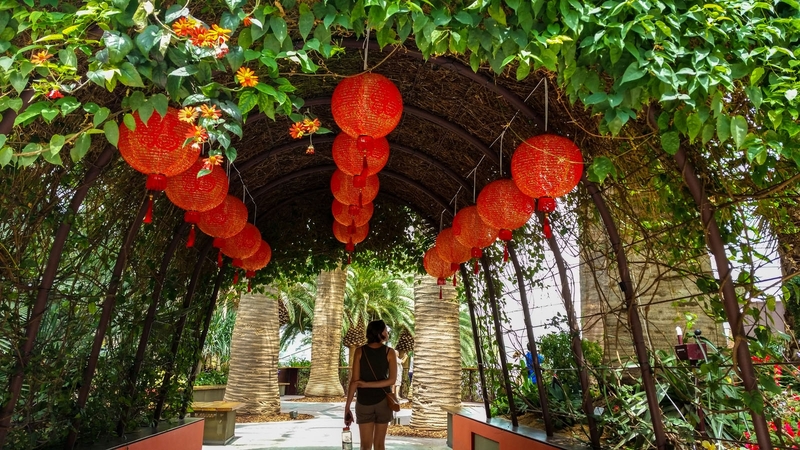 This place is a manifestation of ingenuity, a large budget, and an extra-green thumb. 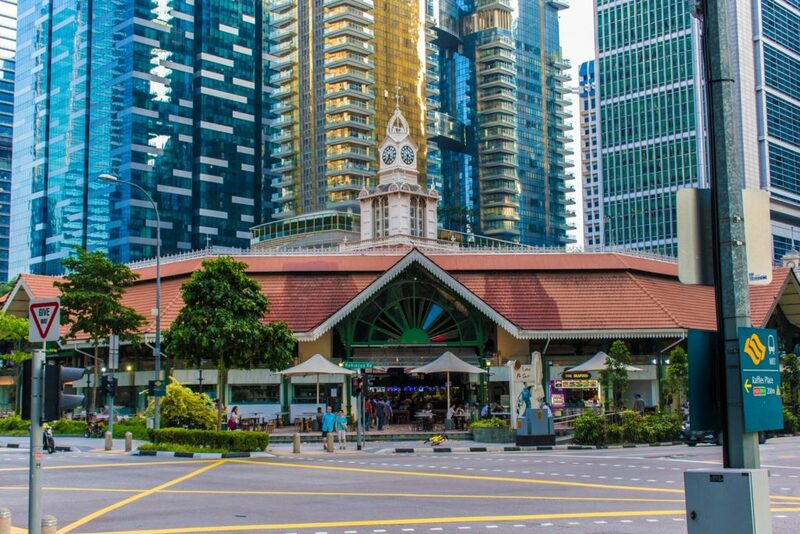 It’s unlike anywhere we’ve ever been and to top it all off, it’s nice and cool inside so you can take a break from Singapore’s equatorial climate. After you’ve explored your way around The Cloud Forest, get lunch at Satay by the Bay: a food court featuring a bunch of different stalls hawking all sorts of delicious food for very reasonable prices. Once satiated, head over to the Flower Dome (another fantastic arena filled to the brim with all types of horticultural achievements, the likes of which would have made any king of any previous era green with envy). The Flower Dome is gorgeous, a walk through what the world can grow from cacti to bonsai. The Flower Dome. It was epic. After processing what you’ve just seen, and going back to your hotel for a nap and a shower: it’s time to eat again. Clarke Quay is a lovely area to sit and watch the boats on the river go by. We enjoyed taking a load-off there after all the walking we did at Gardens by the Bay. You can actually get some happy hour deals there and buy yourself a drink for a reasonable price! Other places in Singapore offer drinks, including the famous Singapore Sling at the Raffles Hotel, but we didn’t like the taste (or the price) of that cocktail and found that Clarke Quay was a much better deal. The amazing thing about these stalls is that the menus generally consist of 1-5 items and the cook makes those items millions of times, crafting a delicious meal that they can whip up in minutes, which us mere mortals would probably need hours to get half as good. And then (unbelievably) these demi-gods only charge a couple of bucks for their masterpieces. To say that these dishes are “good” is an understatement. They are as varied and complex as the person who makes them, each plate an example of personal history, tradition and pride (if done well). One example of a dish done really well is what you can get at The “Hill Street Tai Hwa Pork Noodle” stall, run by a guy who looks to be in his early forties and moves like a machine, carefully weighing each spoonful of ingredients into a bowl. He hardly looked up from his work as we stood in line to order. For $8 SGD ($6 USD) each Jackson and I had a delicious bowl of Michelen-Starred (!) food. Fort Canning park is located on the highest elevation of the Singaporean island. It is a rather small park if judged by other international city park standards, but it has a really long history. We enjoyed walking along the 14th Century Walk in the park. A Singapore itinerary should include at least a couple of history lessons about this incredibly diverse and important island. The 14th Century Walk is one of them. On the trail, which is a well-paved path that winds its way up and down Fort Canning Hill, there are information plaques every few meters. I can’t say that all plaques are created equal – some, for example talk about a stone in a river and how important that stone is and then it is never mentioned again!? – but some have interesting facts about the area. We liked the quiet of the park and the large, beautiful trees that grew there. Raffles mansion was beautiful and we enjoyed checking out little hidden staircases that led to damp basement areas used by the British. Just be sure to bring some good mosquito repellent before you go: I got covered in bug bites. Fort Canning Park is free. Get there early to beat the heat and the worst of the crowds! 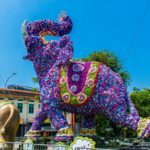 If you are going to spend 4 days in Singapore, you’d be a fool not to go check out Little India. We went to the Tekka Food Court: a foodie’s heaven-on-earth. Inside this rather nondescript building, packed full of people- you can get your hands on delicious, spiced, exotic Indian food. We got some Chicken Tikka and fresh naan bread that was so hot and fresh it burnt our fingers. As we ate in the simple cafeteria, two men were next to us were chatting away in their language and I felt transported by the sounds that surrounded us: the clang of pots, scrapes of chairs, chatter of people, the spicy smell of cooking food… It all felt so alive and foreign. Highly recommend going there. We walked around the building after eating and went and into a market full of butchers, fish, vegetables, spices, and dried food. The place was full of smells! I couldn’t stop staring at the butchers hacking away at lamb and goat legs. They’d look up and smile in the hopes I might buy something. 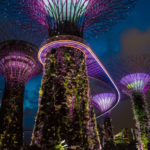 If you are wondering what to do in Singapore for 4 days, just bearing quiet witness to daily life is one of the best ways to really soak up the culture of this beautiful city. The Entrance to Little India, quite extravagant! Personally, I love to find markets and walk around. It’s a great way to see how another portion of humanity lives and it’s an incredibly enriching experience. The markets in Fez, Morocco, for instance, totally blew my mind. And this market, in the back of the Tekka Center Food Court did the same thing. 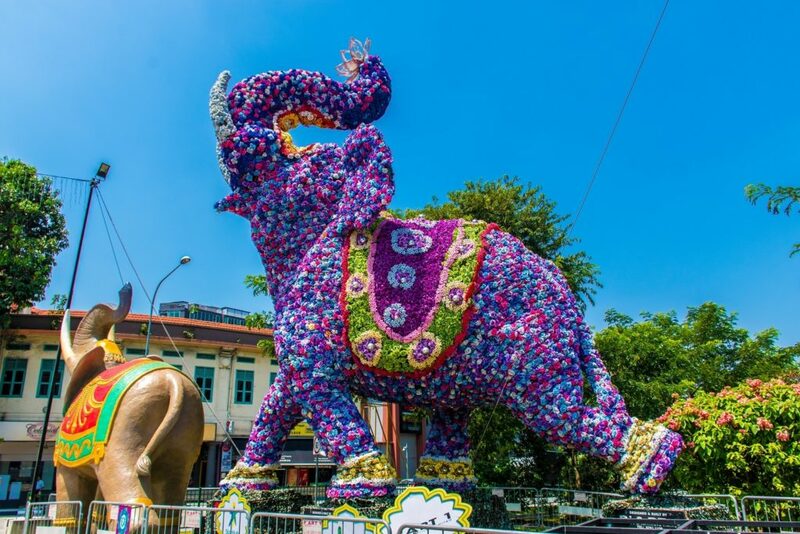 On Serangoon Street you can check out the Sri Veeramakaliamman Temple. It’s quite a striking example of Hindu architecture and can get very crowded. When we went, it was very crowded and we poked our heads in to take a look around. 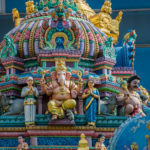 If you visit a Hindu temple on your Singapore itinerary, be sure to take your shoes off at the entrance, have a shawl to wrap around any exposed shoulders, and don’t wear anything that reveals your legs above the knees. Observing the dress code is important and a sign of respect. We decided to walk to our hostel from Little India and as we were going we ran across Masjid Abdul Gafoor Mosque. This was not far from the main drag of Little India at all- 4 days in Singapore means a smorgasbord of world religions. This mosque was so striking we stopped to gawk and a friendly volunteer who worked in the building invited us inside for a tour. Honestly, prior to this, we’d spent no time in a mosque. This beautiful building was such a treat to go inside to see. There were no other tourists there and we had the place to ourselves as our wonderful guide explained prayer schedules, talked about Islam’s similarity to Christianity and Judaism, and walked us through his culture. I was fascinated and a bit embarrassed at how little I knew. He seemed genuinely glad we had come to check the place out and learn about his culture. Highly recommend stopping here on your Singaporean 4 day itinerary. It’s definitely off the beaten path and not nearly as popular as the Masjid Sultan, which – although striking – can get really crowded. Saint Andrew’s Cathedral is a lovely, but incredibly stark, contrast to the colorful Hindu, Islamic and Buddist temples that are dotted around the city. The Cathedral sits in the Central Business District of Singapore and is a very pretty respite from the busyness of the city streets. It’s the largest cathedral in Singapore and quite a contrast to the eastern temples. We poked our heads in and marveled at the contrasts between cultures, yet again. In fact, Singapore is nothing if not a melting pot of culture, tradition, food and religion. We’ve never been anywhere else quite like it. One of the classic icons of Singapore, if you are asking yourself about what to do in Singapore in 4 days, a quick trip to visit the Merlion and take some super-duper, only-in-Singapore shots of the Marina Bay Sands hotel and the surround skyline of the city. The Merlion is a really popular destination for tourists so we recommend getting there early in the morning to beat the worst of the crowds and the heat. Alternatively, you can come at dusk – more tourists, but the sky is really pretty and the twinkling lights of the city are lovely. This is a great place to go if you want to avoid any rain while on your Singapore itinerary. We spent a few hours walking around the (surprisingly) empty halls of the gallery. Tickets were $20SGD ($15 USD) entrance each. I liked looking at the South East Asian art, which told stories of the struggles and lives of this area of the world. It was a lovely collection, although the building was really hard to navigate. The art is in what used to be the old Singaporean court house. There are courtrooms and holding cells sprinkled around the building, making for a somewhat confusing presentation – imagine walking through an art gallery and then stumbling into a marbled court of law. We just went with it as best we could, however, we wound up walking into the special collections exhibit without knowing. After a short while, a staff member stopped us and asked us to leave (we hadn’t paid to see the special exhibit!). Whoops. Not very well marked for poor, idiot tourists like us! Unlike Little India, Chinatown felt tamer, but with more stalls on the street selling an unbelievable amount of knick-knacks. Lots of plastics, rubs, red lunar New Year signs, and cheap clothing. 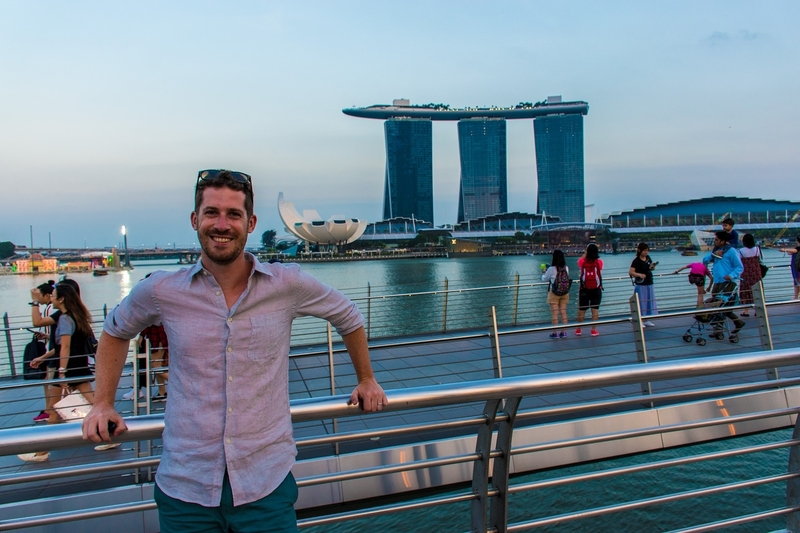 Spending 4 days in Singapore means going to the wildly different neighborhoods, though, and although this was a bit overwhelming, it was still cool. 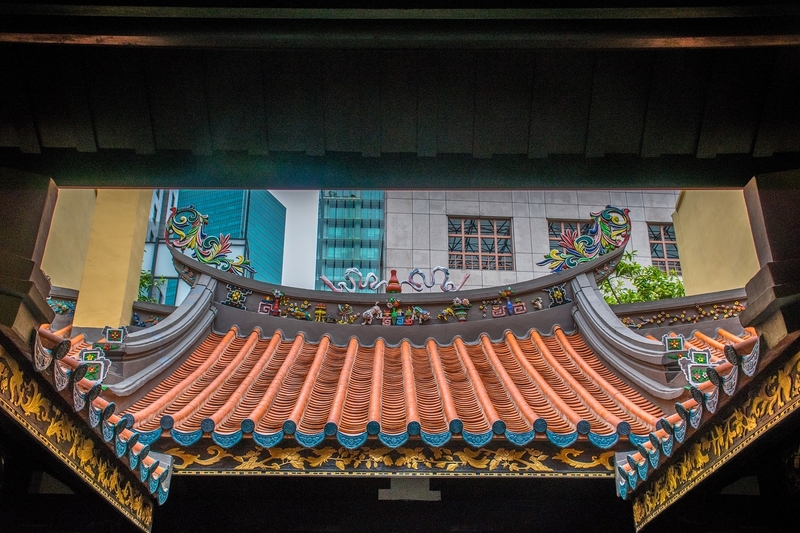 As you walk in Chinatown you can’t help but not notice the Buddha Tooth Relic Temple. The temple’s striking red facade sticks out like an exclamation point in the middle of the street. The temple is free to enter and a MUST see! It was gorgeous inside! We marveled at the detail, the thousands of small buddhas that lined the walls, the gold foil on everything, and monks chanting. The silence in the front hall was often punctuated by the clink of coins hitting prayer boxes. What a contrast to what was happening outside! Walking in to this building felt like walking into a dream. There were other tourists there, but it didn’t feel crowded or overwhelming. We got ourselves a delicious red-bean and green-bean-paste pastry at Tong Heng, not far from the Temple. We ate, standing on the street, the crumbs falling off our finger tips and lips. A delicious little snack. Walk over to the Thian Hock Keng Temple. It was a lovely old temple boasting a traditional build process. This means: using no nails and it was supported entirely by stone and wood stacked on itself. Quite a contrast to the modern Singaporean structures that surround this place! The deities were ornate and lovely and there was a heady scent of incense. I think 4 days in Singapore should include a stop here! I liked walking around the complex and contemplating the heavy-lidded deities. Unlike Buddhism’s serene, relaxed faces, these gods had a range of facial expressions from anger to serenity. I really ejoyed the concept of “Door Gods”, smaller gods to pray to to keep out intruders. Their depictions made them look fierce. Fierce faces are used to intimidate wrong-doers; the deities looked like they took their jobs very seriously. For the final day of your 4 days in Singapore, we’re back in the Downtown core for the second half of the day. Start the day early and bright in the Botanic Gardens, though. Starting early will help you avoid the worst heat and crowds. The Botanic Gardens are free and it took about 30 min by train to get out there from downtown. What we were after was the Orchid gardens, a $5SGD ($3.70 USD) entrance. 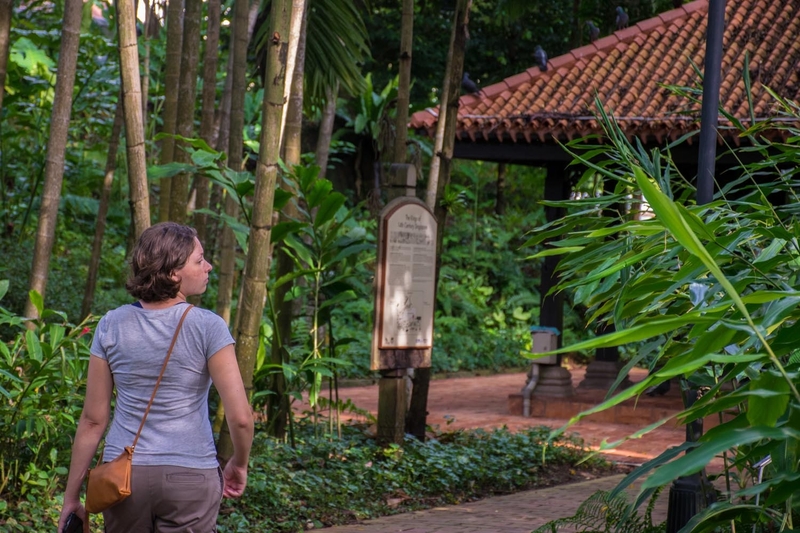 A Singaporean itinerary is not complete without a visit to the Orchid garden. This is a beautiful place to see unique, one-of-a-kind flowers genetically altered to commemorate historical events or visits. The diversity here is astounding. This didn’t feel like we were in the middle of a metropolis! 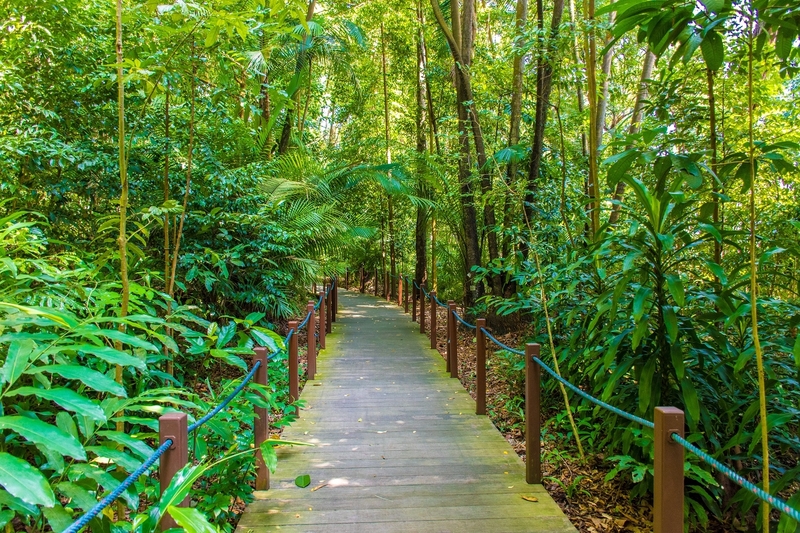 The rest of the Botanic Gardens are lovely – really a must do when completing a Singapore itinerary in 4 days. We really loved walking through the Rainforest Area where bird-watching enthusiasts would set up with their equipment in the hopes of catching a rare bird. Exploring the Botanic Gardens can take hours – make sure you bring water and sunscreen! 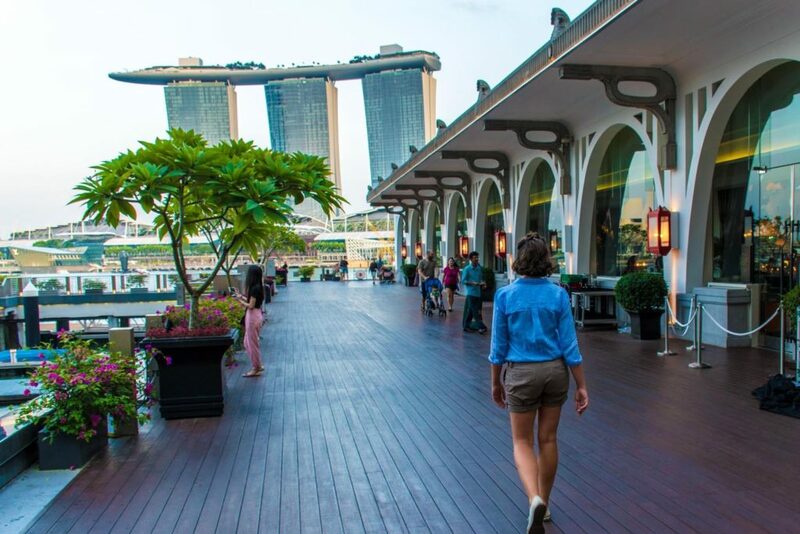 If you like shopping or just gawking at a mega-mall that features its own river down the middle, consider a trip to the Shoppes at Marina Bay Sands while on your 4 days in Singapore. This mall is unlike any we have ever seen and the word “epic” does not really do it justice. This is chock-full of brand-name clothing stores, food stalls, and entertainment. Plus, it is beautiful. It’s quite the contrast to the heat and nature at the Botanic Gardens! The Mall opens at 10am and closes at 11pm. We went to look around after we’d seen the Super Tree Grove and had dinner. We found the mall very calm and quite later at night. I was shocked at how expensive some stores were. I went into a lingerie shop and fingered a beautiful bra until I realized it was $500 USD! Yowza! We discovered that the Super Trees in The Gardens by the Bay light up at night at 7:45 and 8:45pm. Viewing the trees from the ground is free. We went to check these babies out after a nap and some more food. The light show was OK. The first 30 seconds were fun and then the magic wore off. They pumped “music of the far east” over the microphones and cheesy Hollywood-takes-on-China music played as pinks, blues and purples lit the trees. Meh. We stayed for 2 songs before leaving. This display struck us as a chance to take a lot of Instagram-worthy pictures for tourists. 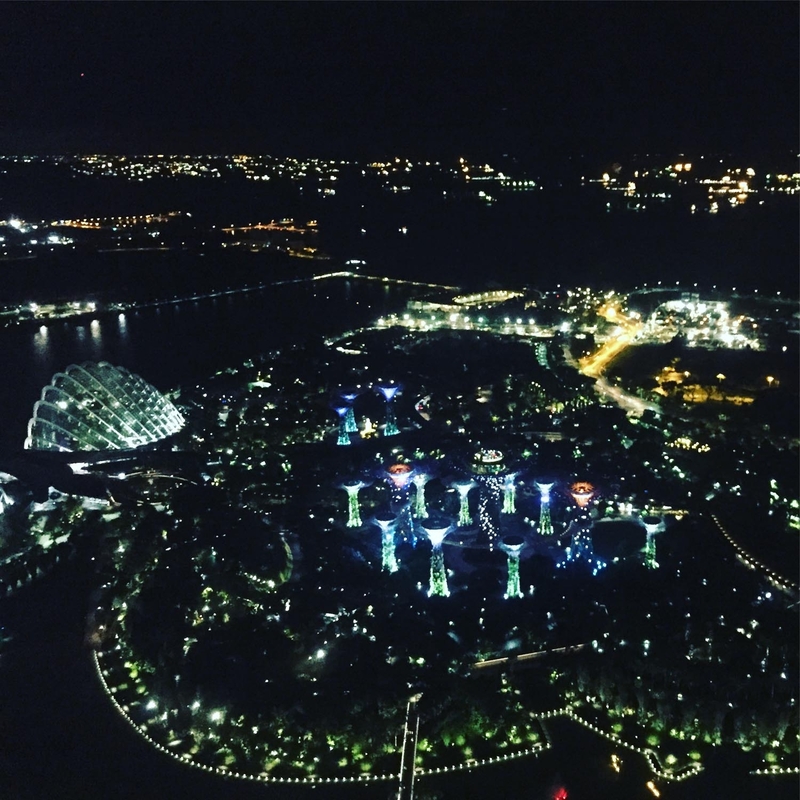 Finish your 4 days in Singapore by going to the top of Marina Bay Sands and getting a cocktail. Marina Bay Sands is an iconic part of the Singapore skyline. This building looks like a large boat fell from the sky and landed on three buildings. The top of Marina Bay Sands boasts the world’s largest roof-top swimming pool. This is a major attraction and for good reason: its views of the city are incredible. Getting into the pool is not a matter of bringing your bathing suit, however. Only guests of the hotel are allowed access. Oh, and if you want to stay at the Marina Bay Sands Hotel, expect to pay upwards of $500USD a night. I would be lying if I said we didn’t seriously consider spending a night at the hotel just to get into that pool. We didn’t. $500+ bucks is a lot of money. Maybe if we return to Singapore for a 3rd time, we’ll splash out and add this stay to our Singapore itinerary. Just because you can’t get into the pool doesn’t mean you can’t enjoy the views from the top, though! Club 55 was a nice excuse to see the city from the top and watch the Super Tree light show from a very different perspective. Good luck on your trip! If you have any other questions about what to do in Singapore in 4 days, let us know!